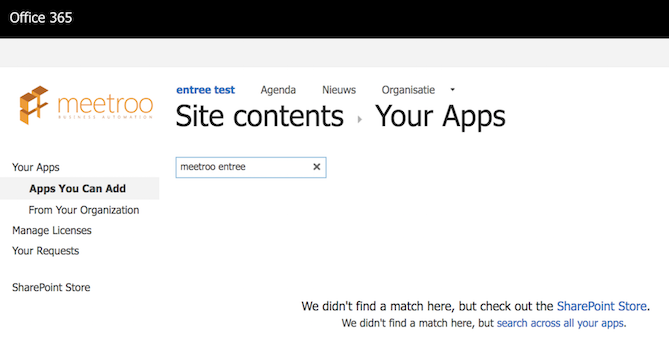 As part of the install process for the SharePoint app 'meetroo entree free' you are advised to "go to site contents", Select "new" and choose "App", and in to search for the 'meetroo entree free' app in the next screen. But the result comes up empty. What now? if it still does not show, maybe something went wrong in the upload process. Try to upload the entre app again. Still no result? Have a look at our installation checklist or contact us via the contact button in the right corner of the screen.